(Scottsdale, AZ) – June 8, 2012 – Valerie Thompson, owner/driver of the Valerie Thompson Land Speed Racing Team, joined an elite group of “Mojave Magnum 200 MPH Club” members at this premier event when she piloted her Martech Services Company BMW to a top speed of 209.5 mph over the new 1.5-mile course on June 2 in Mojave California, reportedly making it the world’s fastest production BMW S1000RR. Teammate Bob Sellers recorded a top speed of 219.5 mph on his Suzuki Hayabusa. “Co-Crew Chiefs Ray Garcia and Bob Sellers were key in setting up my BMW at the Mojave Magnum Speed Trials. 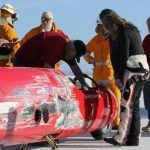 Our bike was really flying,” said Thompson. “We achieved one of the team objectives by gaining entry into the ‘Mojave Magnum 200 MPH Club’. 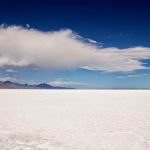 My next goal is to become a member of the famed ‘200 MPH Club’ at the Bonneville Salt Flats,” added Thompson. “I’m honored to help Valerie’s independent team in achieving this accomplishment. Valerie and her team have worked hard with limited resources to gain optimal results,” said Sellers. “Valerie’s driving was ‘top notch’ and the BMW really responded to our special set up for this competition. I can’t imagine what we could accomplish with a little more sponsorship funding,” added Sellers. e first time competitors could race a section of runway exactly one and a half miles in length. 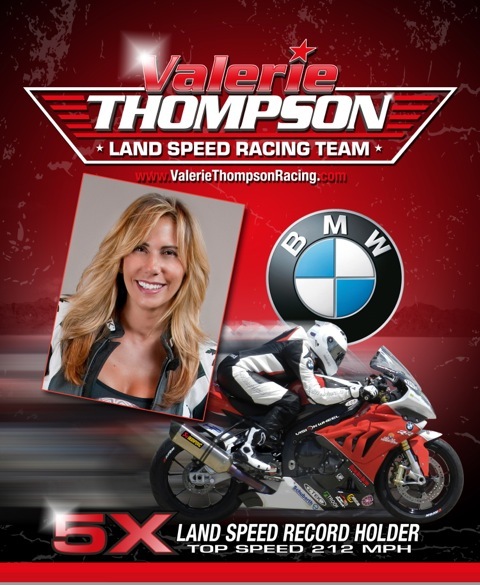 Thompson is owner/driver of the Valerie Thompson Land Speed Racing Motorcycle Team. 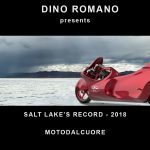 She currently holds two land speed records at the Bonneville Salt Flats. In addition to land speed racing, Thompson has competed in the All Harley Drag Racing Association & National Hot Rod Association series. Thompson was recently selected to test pilot the North American Eagle Supersonic Speed Challenger designed to eclipse the 512 mph land speed record set by Kitty O’Neil in 1976. If successful, Thompson will become the “World’s Fastest Female.” Thompson’s sponsors include Martech Services Company – maker of quality air breathing products, La-Man Corporation, CTEK Battery Chargers, Troon Enterprises, JEGS, Worldwide Bearings, GO AZ Motorcycles of Scottsdale, Swisstrax, Stand Up Photos, Vortex Racing, Hyperpro, and ZipFizz Healthy Energy Drinks.